Hey Love: Finds Under $50!! Clutch Love!! Great finds! Love that lobster clutch! The lemon ones & evil eye one are my favorites! Love the red & white striped one and that orange and blue one! Aw they're all so cute! I love the eye one! I'm loving on the orange and white demask looking one! Loving your picks! 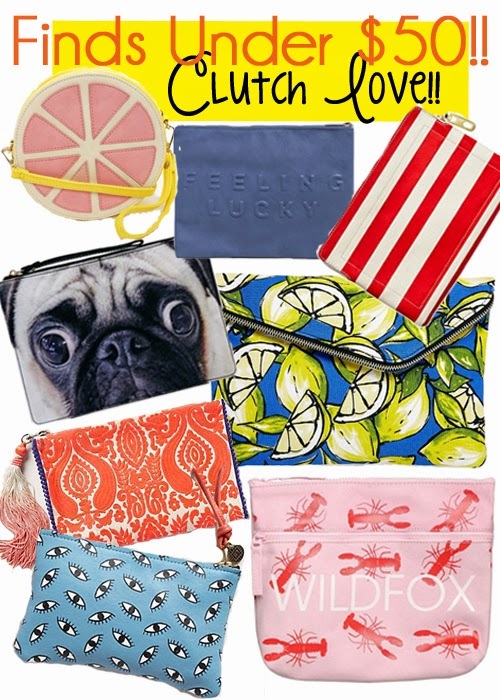 Too funny I bought the lemon clutch yesterday and had to resist the puppy one because I wasn't sure if it was too quirky as much as I loved it!